Today we announced the promotion of several key staff members and the hiring of two new employees. 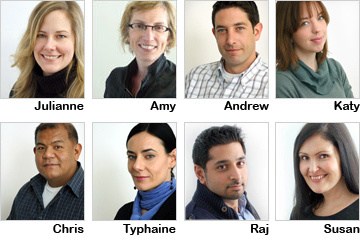 The reorganization and continued growth at the firm, which includes award-winning strategy and design teams in addition to the online AskingCanadians™ panel, builds upon the momentum gained in 2010—a year in which the company experienced 40 per cent growth and new client acquisitions in the technology and media sectors. Delvinia has appointed Julianne Smola to the role of Vice President of Panel Experience for AskingCanadians™, where she is now responsible for building and ensuring the data integrity of the online panel. Amy Sullivan, the new Vice President of Customer Insight, is responsible for overseeing all research and analytics activities, and Andrew Kinnear has assumed the role of Vice President of Customer Experience, where he is responsible for leading the firm’s creative design and technology initiatives with a focus on customer experience. In addition, Katy Pedersen has been named Director of Operations, Chris Andaya is now the Director of Data Collection for AskingCanadians™ and Typhaine Le Corvec has been appointed Acquisition Manager for AskingCanadians™. Raj Manocha joins Delvinia’s data collection team as Director of Sales for AskingCanadians™ and Susan O’Neill joins the company as Public Relations Manager.